Painted on location in Clairemont. 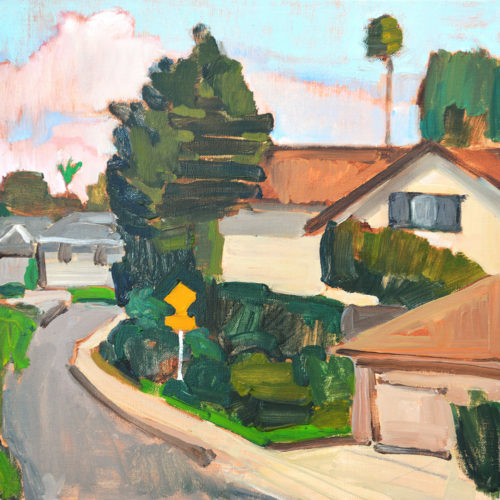 This entry was posted in Landscape Paintings and tagged 12 x 12 inches, kevin inman, oil on linen on panel, san diego, suburb on February 26, 2019 by Kevin. 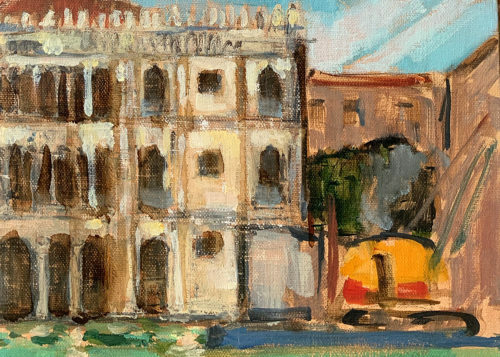 This entry was posted in Landscape Paintings and tagged 5 x 7 inch es oil on linen on panel, italy, kevin inman, venice on February 18, 2019 by Kevin. I love Roman stuff. And I loved the shape of this tree. 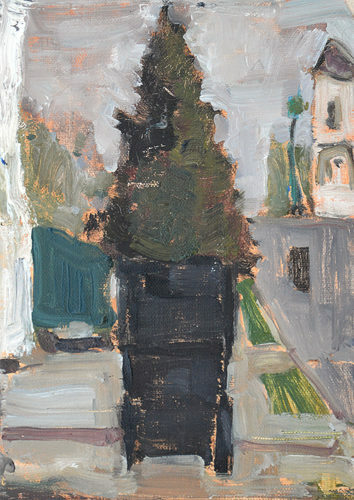 This entry was posted in Landscape Paintings and tagged 5 x 7 inches oil on canvas on panel, kevin inman, merida, spain on January 25, 2019 by Kevin. 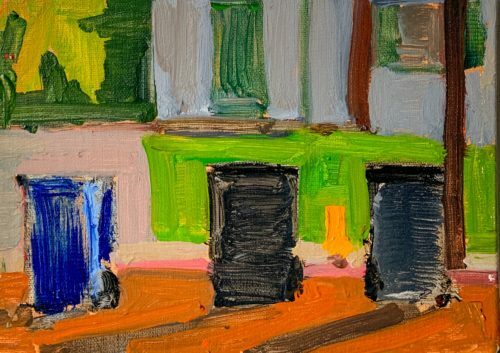 This entry was posted in Daily and tagged 5 x 7 inches oil on canvas on panel, kevin inman, landscape, trash cans on January 21, 2019 by Kevin. This man was haranguing me for painting too close to his house. So I painted him. 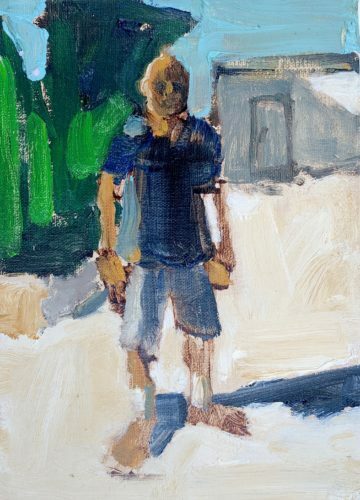 This entry was posted in Figure Paintings, San Diego Paintings and tagged 7 x 5 inches, california, figure painting, kevin inman, oil on linen on panel, san diego on January 4, 2019 by Kevin. 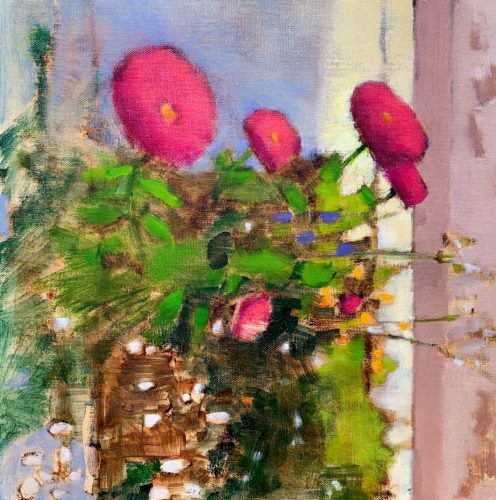 This entry was posted in Landscape Paintings and tagged 12 x 12 inches, floral, flowers, kevin inman, oil on panel on November 17, 2018 by Kevin. I painted this after a frustrating day at the hospital. Turned out to be whooping cough! Ugh. Painting always relaxes me when I’m stressed. I just drove into a neighborhood, parked, and walked until I found an enticing spot. 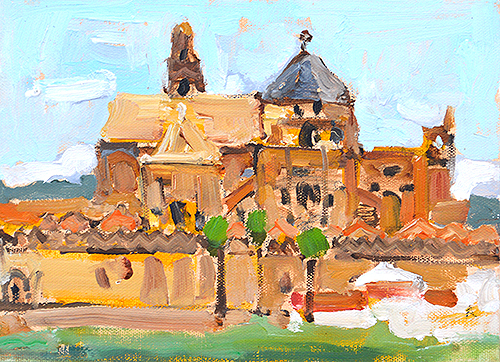 This entry was posted in Landscape Paintings, San Diego Paintings, Urban Landscapes and tagged 5 x 7 inches, impressionism, kevin inman, oil on linen on panel, plein air, san diego, streetscape on September 30, 2018 by Kevin. 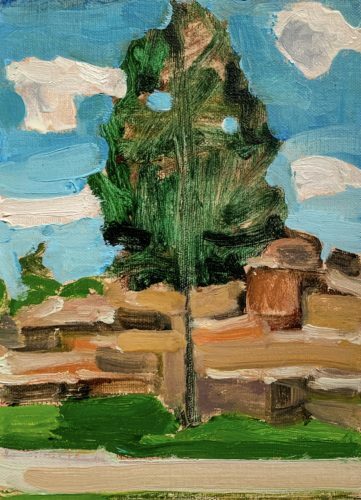 Found this one by accident one afternoon and it was still up under gray skies the next morning when I had some time to paint. 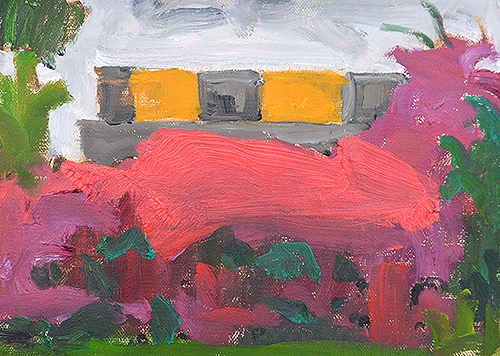 This entry was posted in Landscape Paintings, San Diego Paintings, Urban Landscapes and tagged 5 x 7 inches, bougainvillea, california, kevin inman, oil on linen on panel, san diego, termite tent on July 13, 2018 by Kevin. This is from last October. I was staying in an old farmhouse in Tuscany. 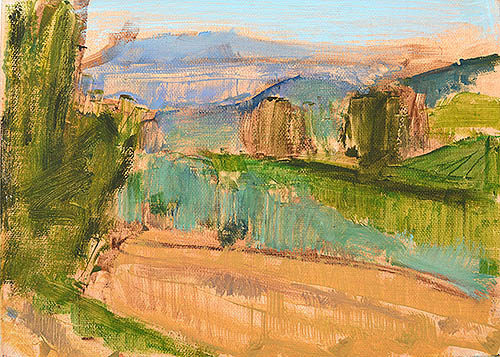 This entry was posted in Landscape Paintings and tagged 5 x 7 inches, italy, kevin inman, landscape, oil on linen on panel, tuscany on March 20, 2018 by Kevin. 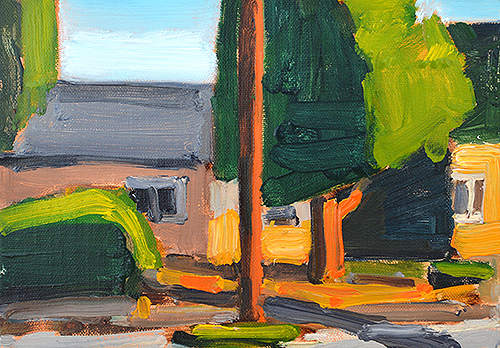 This entry was posted in Landscape Paintings, San Diego Paintings, Urban Landscapes and tagged 7 x 5 inches, california, california landscape painting, christmas tree, kevin inman, landscape painting, oil on linen on panel, san diego, trash can on January 21, 2018 by Kevin. I rented an apartment on AirBNB in Rome with a partial view of Castel Sant’Angelo, an ancient structure later used as a fortress by the Popes. The view was very partial, you could really only see it by peering over the neighbor’s patio through some kind of spiky screen covered in plastic vines. 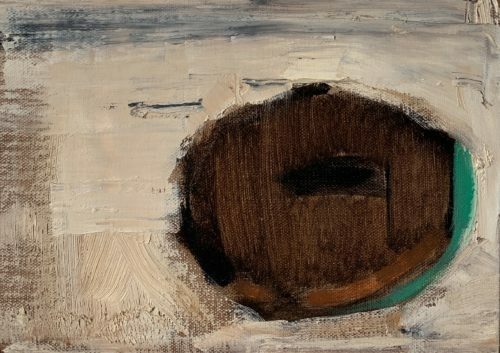 To get around that for the painting, I stood on the rickety metal steps to the roof with my easel in a planter box, on top of the crusty remains of departed flowers. In gale force winds, but I didn’t blow off. 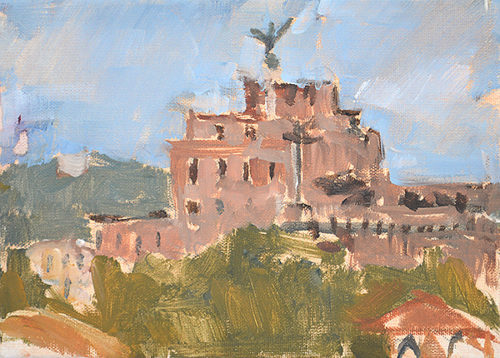 This entry was posted in Landscape Paintings, Urban Landscapes and tagged castel sant'angelo, city painting, italy, kevin inman, landscape painting, rome on December 2, 2017 by Kevin. Painted on location in Point Loma. The guys who live in the two houses behind me came out and told me the couch had been out there for a month. Apparently it was a rocking selfie spot. Also an unbelievably noisy place to paint. It looks like a quiet residential street, but there were cars and trucks blasting past in a constant stream like it was a freeway, and plane noise as well. But that’s San Diego. I’m sure these modest homes are worth close to a million dollars. 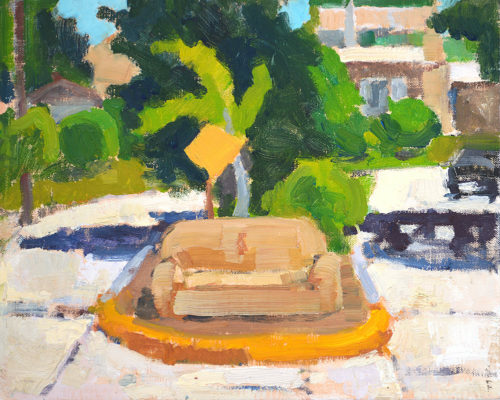 This entry was posted in Landscape Paintings, San Diego Paintings, Urban Landscapes and tagged 8 x 10 inches, couch, kevin inman, landscape, oil on linen on panel, plein air painting on September 22, 2017 by Kevin. White peaches from the Korean store. 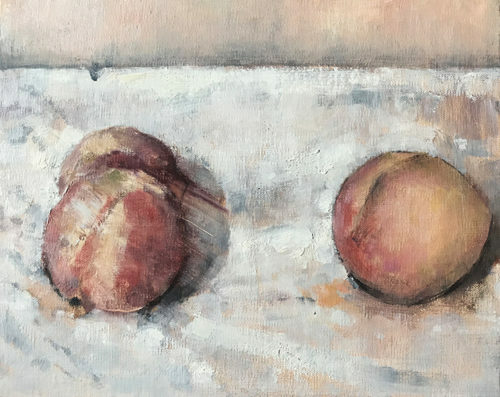 This entry was posted in Still Life Paintings and tagged 8 x 10 inches, california, kevin inman, oil on linen on panel, san diego, still life, white peaches, zorn on September 11, 2017 by Kevin.